How do you celebrate your own uniqueness and how do you make time for yourself in order to be authentic and true in the world? This months New Moon Reading is a soft and gentle reminder to ask these questions of ourselves. In a spread that is dominated by the suit of cups, we are being guided and nudged by our emotions and feelings. There is no turbulence here, only a sense of calm knowing. This is clearly a synchronistic spread lining up in tandem with the new moon in Pisces, an astrological sign so inseparable with the watery qualities of our emotional nature. Setting up the 3 cards as a storyboard, we see the middle card as a dip into the subconscious, revealing the underlying message that links all three together. There are some interesting clues along the way about what this reading has to offer. Firstly, in the 3 of Cups, it is clear that we are not only participating in joy, but also sharing it in a collective way. We have come together with others to work at creating something that we each can benefit from. For the moment, we are swept up in a harvest dance. The three women here are visually intertwined and one’s joy seems to be another’s joy as well. It is almost difficult to see whose arm belongs to whom. The element of water is spilling over between people. Happiness knows no boundary. As the day’s exuberance reaches its end and the ‘day turns to night’ in the next card, the 8 of Cups, something is calling us inside literally and metaphorically. The contrast between the intertwined boundary-less women and the wall of cups in the 8 is a visual clue about creating space for ourselves. The 8 of Cups shows emotional stability in the way the eight cups are stacked. Nothing is spilt so nothing is really lost here. 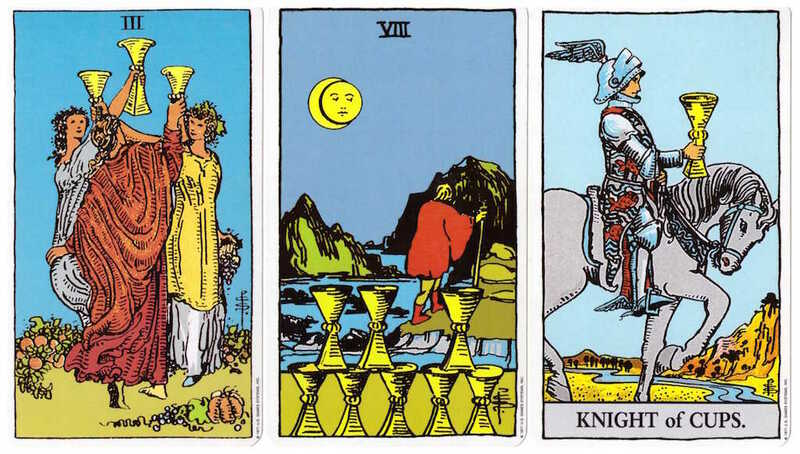 However, the figure in the space of the missing stacked cup implies the 9 of Cups and how we fill the missing link in order to experience the success of our inner fulfillment. It is a precursor to an outward physical manifestation; we cannot experience true outer fulfillment until we have nourished our inner life, and for that, we need to create a healthy boundary. There is another aspect between the 3 and 8 of Cups that needs to be considered. There is a Solar Eclipse in the 8 of Cups. However positive and joyful the experience of the 3 of Cups is, we still must ask whether we are in the right spot with the right people. In most situations, this is simply about making sure we haven’t lost sight of ourselves. The eclipse, if anything, is signalling a new relationship with our own needs, our personal ways of relating and the manner in which we formulate narratives that govern the way we interpret events in our lives. Whatever is causing us to trip up also has the ability to be exposed and be deemed counterproductive to a positive inner dialogue. Now, the moment of re-emergence has arrived. The Knight of Cups appears here boldly. His back is straight, he looks forward clearly, and holds outstretched a cup that looks both like an offering to the future and as a statement about his individuality. It seems as though whatever we were searching for or nourishing in the cave of the 8 of Cups has paid off. The Knight has definite opinions about what is good for him and what he needs in order for his emotional life to be vibrant and healthy. He is representing an aspect of ourselves that we are now embracing, one that is not overtaken by any misguided notions about what others think we should be or do. We have a renewed accord with our personal allegiance and integrity. What the Knight also seems to be suggesting as he holds his cup is that he is taking it somewhere. This could imply a transition stage to something personally lucrative for us. If the missing cup in the 8 of Cups implied the 9 of Cups card, then might it be reasonable to suggest that we are taking our cup to the experience of that card? We’ll leave that for the future to reveal. What is important now is to acknowledge our own self worth and to ensure that whatever collective experience we participate in, it is always from the cup that we hold, that we have filled, that indeed is overflowing with our love and generosity. If our cup is not overflowing, we need to ask why not. In the asking, we must find a route to replenish it, to find the keys to locked doors, to ask ourselves what is holding us back, and to have the courage to walk alone – even if just for the moment. wonderful layout and your reading of it resonates really well; I really like how you connect the details of the cards with one another; very helpful:) thank you!